JMT Architecture christened their new virtual reality studio in the Baltimore Studio with a visit from client Loyola Blakefield. During a project progress meeting, members of the Loyola Blakefield staff were invited to “walk” their new space – the Innovative Learning Center that includes middle school classrooms, cyber and robotics labs, an open media center learning commons area, and a green roof. 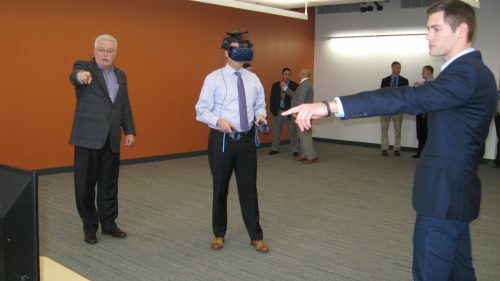 As shown in the photograph, users navigated around the 3D virtual space wearing VR goggles and using handheld controllers, while others watched a television screen broadcasting the same view. The virtual reality studio uses specifically positioned sensors to create a parameter that correlates to the virtual space where, when users walk around in real life, they feel like they are “walking” in the virtual world. The VR space/experience allow the client to explore, and even approve, design plans before construction. Concerns noted in VR can be addressed earlier in the process, potentially saving time and money. JMT Architecture uses Revit Live for the VR modeling and is exploring other programs and software to continue to expand capabilities.